Only a few days left till Verizon will offer the iPhone and ATT gets cold feet. ATT is sending to all their iPhone customers an email to show that only ATT customers can surf the Internet during taking a call. So simple but true. Everybody at Verizon will miss the feature. To compensate this problem, Verizon is offering for a limited time unlimited data, but don't be fouled, it won't last forever. I lucky wise could grandfather my unlimited data plan ATT. 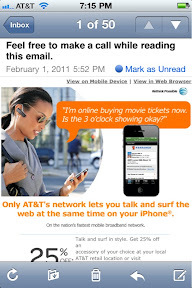 The email from ATT offers as well 25% off on iPhone accessories. My Tip, regardless of discount, you should stay with ATT if most of your friends are with ATT, if not still stay with it. I love the rollover feature, this allows you to use the lowest minutes plan, keep a few months under and you have enough minutes left for the rest of the year. And reading email or receiving an image during call is awesome and often in use. If you play a game which gets info over data, you don't need to stop it to take the call. The pricing at ATT is actually around $5 better and the 3G (when it works) is even faster than Verizon. I had no problems yet but I don't live in NY or LA. And if everybody moves to Verizon then the network might go down as well. Verizon website was down when the iPhone was announced, same for ATT when iPhone 4 came out at ATT. I heard Verizon did learn a lot from ATT mistakes, but I assume not enough to know that there might be a lot of website traffic when the iPhone is announced, so why should they then learned more in terms of updating their towers? And one slight very unimportant thing if you are not a traveller. Verizon iPhone will NOT work in Europe and most other countries besides US, Korea and 38 other countries. 75% of countries are on the GSM network, but 20% on CDMA, and guess what network Verizon is on? it is good that there is a Second Provider. Because i can reduce my iPhone bill by $20 (already did) by telling ATT I would move to Verizon. I stayed and got discounted. I love open market.